How to share and manage your important all-hands announcements on Honey. 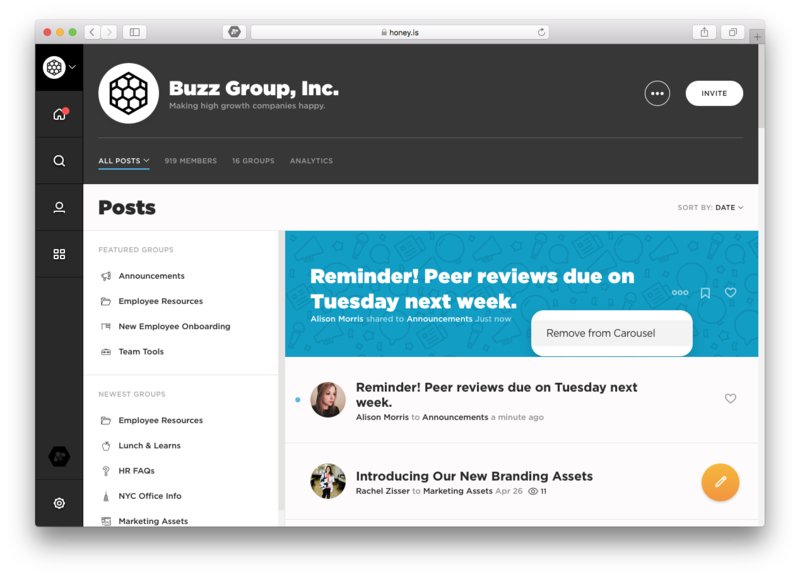 If you're a Honey admin, you have the option to create an announcement post—a powerful internal communications tool built for your most important content. How an announcement post is different than a regular post. Is added to the announcement carousel on your organization page. Is sent in an instant email to all users, no matter their email notification settings. Is sent in a push notification to users who have our iOS or Android app installed. How to share an announcement post. Toggle the Mark as Announcement switch to make the post an announcement. Please note that posts must be made announcement in this step and can not be changed retroactively. Finally, click the blue Share to... button to share your announcement post. Your post will publish. It will be visible in the announcement carousel located in your organization's feed. It also will also then send a mandatory email notification to all users in the organization and a push notification to those with the Honey mobile app. Removing an announcement from the carousel. By default, your announcement will stay in the announcement carousel on your organization page for two weeks—after which it will return to the feed like a normal post. Visit your organization page by clicking your organization icon at the top of your lefthand navigation menu. On the announcement that you'd like to remove, click the three dot button. Select Remove from Carousel. This will remove your announcement from the carousel but will keep your post intact in the feed. In the page header click the dropdown arrow next to All Posts. Select All Announcements. This will update your feed to display all the posts that have been share as announcements. Converting a regular post into an announcement. Unfortunately, at this time, it is not possible to turn an existing post into an announcement post.